Set in the picturesque area of Killarney 69 bedroons offering every modern amenity. A few minutes walk to Killarney National Park & convenient to town centre. There is an excellent bar with music most nights during season. Victoria House Hotel Killarney is one of the finest hotels in Killarney and overlooks Killarney National Park. A hotel offering luxury accommodation for all seasons a place for all activities a venue for delicious dining a place full of family-run welcomes a place full of traditional Killarney values and the place where unique magical moments and experiences happen for you! Victoria House Hotel is located 1.5 kilometres from Killarney town Ireland s famous tourist destination situated in the heart of the beautiful South West of Ireland. Victoria House is situated next door to the Ireland s National Events Centre (INEC). Private parking is available to all of our guests. Bicycle hire available on site. Jaunting Car cycle and walking paths are just 50 paces from the hotel s doorstep. A visit to the Killarney National Park is a must when in Killarney. Boat trips are available from The Old Boathouse at Muckross House. Here you can also explore Muckross Gardens and Traditional Farm. Knockreer National Park spreads from Killarney Town to Killarney Golf Club and back to Ross Castle and then back up to Killarney House. The Victoria House Restaurant makes a special occasion ..... truly special. With an emphasis on home cooked and locally sourced produce our dishes highlight the best of traditional and modern Irish cuisine designed and prepared by a team of highly experienced and award-winning chefs. Afterwards why not enjoy a drink or two in The Ivy Room Bar full of character with a mixture of old-fashioned courtesy charm stylish warmth and comfort with not one but two glowing fires an ideal choice when eating out in Killarney! With food served all day you can enjoy everything from freshly brewed tea coffee and home-made scones light and tasty snacks to our full ? la carte bar menu. The Ivy Room Bar is popular with all and a great place to meet and linger. Throughout the year we provide a variety of live music and song ranging from traditional gatherings to sing songs. The secret is spontaneity and joining in! The bar is also equipped with a big screen for optimum sports/ games viewing. Our Rooms are all individually decorated with a lovely country house style and others with warm bright stylish colours. Some of these rooms are equipped with a flat screen Plasma TV and have king size beds and the following amenities: - En-suite showers - Satellite TV - Tea and Coffee Making Facilities - Iron and Ironing Board - Hairdryer - Direct Dial Telephone. Wi-Fi is available throughout the Hotel. Need a Killarney b&b? We’ve got cosy rooms with fresh linen, power showers, free tea/coffee and a friendly Irish smile. And all in Killarney town centre and mins from the INEC. 4 bedroom all on suite TV hairdryers tea and coffee making facilities, over looking the Mc gilly cuddy reeks and the river laune, Price includes 3 course Breakfast based on 2 sharing, evening meals on request,we are situated on the Ring Of Kerry. Stepping stone with Cooky Monsters Cafe Ideally placed on Kerry way for cosy accommodation & the best of home cooked food .the perfect starting point for ascent of carrauntoohil.open December 1st to October 31st. The Rose Hotel (formerly Fels Point Hotel) offers guests a haven of style and comfort surrounded by the beautiful Slieve Mish mountains the Kerry countryside and panoramic views of Tralee town. Home to the Rose of Tralee International Festival just minutes walk from Tralee Town Centre and only 15 minutes drive from Kerry Airport The Rose Hotel is the perfect option for both leisure and corporate travellers. We offer FREE Wifi daily newspaper and carparking. We offer a special reduced rate to the Aquadome (Ireland s largest indoor waterworld). Here at the The Rose Hotel we pride ourselves on the standard of service quality and courtesy we offer to all our guests. Each of the 165 luxuriously decorated standard and executive guest rooms at this Tralee hotel provide the relaxation and luxury our guests deserve. Dott s Bar & Park Restaurant serve contemporary cuisine using the best of fresh local produce served in relaxing surroundings. Spirit Gym offers guests more than just a work out with its state of the art gym equipment and sauna steam room & relaxation area. Our Herbs & Roses Spa provides a great range of spa and beauty treatments with a nail bar and a thermal suite to complement your Spa experience. Our salon product Elemis promises to rejunate & revitalise you. Step into the old world charm of the Killarney Avenue Hotel located in the heart of downtown Killarney. With an address on the door step of the world renowned Killarney National Park and a stroll from the town centre the 4 Star Killarney Avenue Hotel is an ideal setting for business or pleasure. The Avenue is quietly sophisticated offering understated elegance and unparalleled service in an intimate friendly home away from home atmosphere Whether organising an event looking for the perfect wedding venue or simply looking to get away for a short break the Killarney Avenue Hotel is truly an inspired choice. Onsite facilities include private underground parking 66 Deluxe Guest Rooms Druids Restaurant guest can also avail of leisure facilities at our sister hotel the Killarney Towers Hotel. Comfort is not sacrificed for the sake of style at the Killarney Avenue Hotel. The 4 Star Killarney Avenue Hotel offers guests a choice of 66 deluxe guest rooms over 3 floors. Our hotel rooms reflect the warm atmosphere of the hotel offering a relaxing and comfortable haven for discerning travellers. The large windows allow abundant natural light and offer wonderful vistas of Kenmare Place while others overlook the Golden Gate entrance to Killarney National Park in Kerry . Magnificent absolutely wonderful stunning gracious delicious. We ll be back . Some of the words written by guests in the Guest Book. Superbly located in the heart of Killarney The Fairview offers a refreshing approach to accommodation and certainly stands out from the crowd in Killarney. The Fairview has won numerous awards for its high standards of accommodation and has been named Killarney s Best Guest House while owners James & Shelley O Neill offer their Irish hospitality. Awards: Trip Advisor Travelers Choice Award Winner 2013 AA and RAC 5 Diamonds Sparkling Diamond & Warm Welcome Award Killarney Best New Development Awards and the prestigious Little Gem Awards. New Fifth Season Restaurant & additional executive deluxe rooms & penthouse now open. /P Neatly set with contemporary interiors the Fairview has a collection of spacious and fabulously appointed rooms. Each has been individually designed with soothing shades and soft furnishings for an atmosphere of luxurious but homely comfort furnished to the highest hotel standards and equipped with all the essential facilities. /P The exquisite dining room is meticulously run by Maitre d Tommy Regan who has 40 years of experience working in the finest hotels in Ireland and who has served every Irish President since Eamonn De Valera in the 1960s. The Fairview s breakfast menu aims to suit every taste whether it s a full and hearty Irish Breakfast a varied Continental Buffet or freshly made pancakes with Maple Syrup. While Tommy is on hand for any specific requests. Blending the charm of times past with contemporary elegance the International Hotel is located at the heart of Killarney town just a stroll from Killarney National Park. A firm favourite with visitors to Killarney the International is one of Killarney s longest established and much loved hotels bringing guests the warmest of welcomes and a promise of excellence. The newly renovated guestrooms are designed and finished with our focus on comfort and luxury in mind and guests are assured of a restful and comfortable stage with every need catered for. The hotel offers a wealth of amenities including tempting menus in Hannigans Restaurant traditional music in Hannigans Bar and a 3D Golf Simulater for golf lovers to play on some of the best courses in the world! After a work out in the gym relax in the sauna before unwinding in the elegant resident s lounge with a snooker table and library. The International Hotel boasts 90 luxurious bedrooms individually designed and finished to the highest standards. Choose from a suite of rooms including Standard Guestrooms Executive Guestrooms and Family Rooms. Features of the executive rooms include Club Class luxury memory-foam mattress comfy duvets with crisp white Egyptian cotton bed-linen Jacuzzi bath Laptop safe with recharging facility FREE Wi-Fi internet or FREE fixed line high-speed broadband Shaving unit Magnified make-up mirrors Air-conditioning American socket facility Bedside LED lighting for intimate reading Laptop safe. Complimentary daily newspapers. Golfers Drying Room. Killarneys 3 Championship Golf Courses nearby. Bus/Train Station 5 minutes. Kerry Airport 15 mins drive. A non-smoking hotel. Few if any hotels in Ireland provide the range of accommodation that we offer at the Hotel Killarney. We have a selection to accommodate all guest requirements including 1-bedroom family suites(56sq.m) superior guest rooms(26sq.m) and family rooms (23sq.m). Please note all accommodation and public areas of the hotel is non-smoking. There are two dining options available at the resort: Our main restaurant Lannigans Steakhouse serves an extensive breakfast buffet each morning. Our evening steakhouse menu offers the best in local chargrilled steaks homemade burgers and ribs. Lobby Bar offers all day casual dining with a wide range of dishes and light bites available. Children are especially catered for in each. At Club Vitae Health & Leisure Club we have lots to offer for all ages... 18m indoor heated swimming pool Toddler & Children s Pool Relaxing Spa Jacuzzi Steam Rooom Pressurised showers Sauna Fully equipped Precor Gymnasium with TV entertainment Smiths Weights Machine Multi-use sports hall Renew Beauty Therapy Suites. Please note: adult-only swimming is daily from 8pm. Children are welcomed with open arms and all that we have designed is with their enjoyment in mind - specially designed kids & teens menus free cots free kids & teens clubs specific childrens entertainment - to name but a few. We acknowledge that families can be time-poor and holidays offer the ideal opportunity to spend quality time together. New for 2010: puppet theatre interactive live animal show kids roller disco walk on water zorbs and retro pogo sticks & space hoppers! The Castlerosse Hotel & Holiday Homes is the perfect place to relax and enjoy it s tranquil setting and view Killarney s Lakes and The Macgillicuddy Reeks Ireland s highest mountains. This Killarney hotel is on the shore of the Lower Lake within 2kms of Killarney town which is a pleasant 25 minute walk through the Killarney National Park. Situated in the centre of Kenmare an ideal base to explore the Ring of Kerry and the Ring of Beara. O Donnabhain s is a popular choice due to its location and the standard of Accommodation Food & Drinks it provides. We provide full guest facilities: Bar & Restaurant Downstairs Reception Breakfast Room and Guest Lounge and even a private car park at the rear of the building which is very useful for guests transferring luggage to their rooms. Our accommodation has been rated as a 3 Guesthouse by the Irish Tourist Board. The rooms are spacious and decorated in a country style with soft colours and pine furniture creating a feeling of simplicity and comfort. Well away from the bar area downstairs so no sleepless nights O Donnabhain s guest bedrooms all have private bathroom TV phone (modem-friendly) and hair dryer Tea / Coffee facilities on request. We have put considerable thought into the layout and finish of the building and have tried to maintain consistent ambience throughout. s Kathleen O Sullivan says: I would never have called it Seaview with so many trees in the front. Equally she s ponders how to describe her establishment. It s really a country house - with country house cooking she says. In that case it s country house cooking of a very high order indeed having won many international plaudits and here in particular one detects the particular passion that puts this establishment high on the must visit list. Dozens of homely and cosy touches help sustain the warmth of the welcome well beyond the front door. There s the absence of hotel furniture in favour of many fine antique pieces. A dining room with many nooks and crannies is fuelled by a kitchen of great quality and a very good cellar and there s a relaxing sitting room that also includes a well stocked bar. All this set in a coastal country that is a joy for leisurely touring. Indeed anyone in a hurry will miss the point - or worse miss Seaview House Hotel. Whatever name it goes by a host of satisfied visitors would be pleased to call it home. Two AA Rosettes for food. Gilbeys Gold Medal Award for Catering Excellence. The warmth and friendliness of the Malton formerly the Great Southern Hotel Killarney is at the centre of the renowned service excellence we have been offering since 1854. The timeless elegance of the hotel building combines seamlessly with all of the comforts of the modern day as well as the charming staff who greet you on arrival. Ideally located in the centre of the town the hotel provides the best of both worlds: tucked away on its own 10 acres of secluded landscaped gardens with the backdrop of the highest mountains in Ireland yet with all of the conveniences of downtown. The Malton is also next to the railway station and just 15 minutes from Kerry Airport so getting there is easy. Privately owned and family run The Heights Hotel Killarney is one of Killarney s leading hotels famed for its warm welcome and unparalleled standards of service. 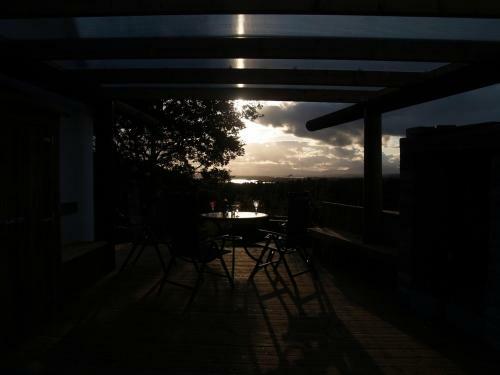 Situated 5 minutes from Killarney town centre its the ideal base for seeing Killarney s sights and visitor attractions. Overlooking the majestic Flesk Valley Torc and Mangerton Mountains the Hotels elevated position offers breathtaking countryside views luxury accommodation a unique and nostalgic atmosphere along with fine casual dining our Orangeries at the front of the Hotel deliver an everlasting welcome to the hotel and can be enjoyed anytime or as part of a special occasion. Killarney Towers Hotel offers Killarney hotel guests all the luxury that you would expect from one of the leading Killarney hotels complemented by the ever-growing number of attractions that Killarney town has to offer. We appreciate that this is your time to relax a time unwind and a time to recharge. The Killarney Towers Hotel & Leisure Centre located in the heart of Killarney Town offers guests an extensive array of onsite leisure facilities dining options bars and evening entertainment. Our 4 star Killarney hotel rooms vary in size and comfort depending on your needs. Whether traveling alone in company or with family we have accommodation in Killarney to suit your needs. Each room offers guests all the modern conveniences that you would expect from a contemporary 4 star hotel. All our guest rooms are spacious & bright and designed furnished & decorated with your comfort and convenience in mind. The Innisfallen Restaurant located on the ground floor level is a defined presence among Killarney s renowned dining scene. A modern and funky setting with mood lighting the Innisfallen Restaurant provides a mouth-watering mix of world wide and local cuisine. You are assured a memorable dining experience and attentive service. O Donoghues Public House also located on the ground floor level boasts an extensive bar menu available throughout the day. Whether for a light bit or something more substantial O Donoghues provides itself as an ideal dining venue attentive staff expansive menu in a relaxed setting The Killarney Towers Hotel Leisure Club offers guests an extensive variety of in house leisure options. Our leisure facilities at the hotel include Sauna Steamroom Whirlpool 15m Swimming pool & newly refurbished gymnasium. 2009 has seen the introduction of the Fit Vibe the latest in vibration training which will enhance any workout. We also can offer Personal Training Gym Programmes Private Swimming Lessons & group Classes. Talk to any member of the leisure club team and find a package that suits you irrespective of the duration of your hotel stay. The Killarney Plaza Hotel and Spa reigns over the town with grace and glamour. For business or pure pleasure a stay at the Plaza entails the ultimate in gracious luxury attentive personal service and the pleasures of an incomparable location adjacent to Killarney s National Park. The unique style of the Killarney Plaza Hotel and Spa is carried through to our guest rooms. Stylish spacious and fully air-conditioned big windows flood your room or suite with light. We have used only the finest wood fabrics and marble to create a blend of elegance convenience comfort and sophistication. There are three restaurants in the Killarney Plaza Hotel and Spa and they all feature excellent food made from fresh local produce served with flair. Choose from a gourmet experience in Restaurant Petrus breakfast or dinner in Restaurant Grand Pey or a relaxed evening in Plaza Bar & Grill. The Killarney Plaza is home to two of Killarney s best bars: Champers Piano Bar and the truly unique Plaza Bar which is actually 5 bars spread over 4 levels. The Killarney Plaza Hotel is home to the exclusive award wining Sundari Spa where you can enjoy a world of adventurous and experimental therapies. 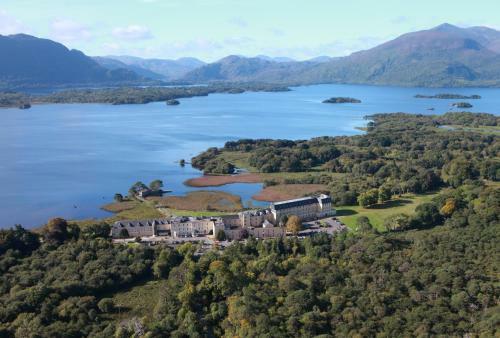 The Europe Hotel & Resort Killarney Co. Kerry enjoys the most stunning of locations on the Lakes of Killarney and at the foot of the magnificent Kerry mountains. The five star hotel which has been welcoming guests for almost fifty years makes the most of its location in every way. From the moment guests walk through the door they are greeted by a two story high atrium overlooking the lakes and throughout their stay whether dining in the restaurant or relaxing in the spa guests enjoy the peaceful vista over the gardens to the lakes. This breathtaking setting offers guests the chance to experience true luxury in the heart of Ireland s south west. All guests enjoy complimentary access to the ESPA at the Europe including 20m lap pool indoor & outdoor vitality pools thermal suites relaxation areas and techno-gym. Horse riding & Indoor Tennis also complimentary Boating & fishing can be arranged from hotel s private pier Killarney Golf Club adjacent. The hotel offers an ideal base from which to explore the famed Kerry beauty spots the nearby National Park Ring of Kerry and the Dingle Peninsula. The hotel is adjacent to the Killarney Golf & Fishing Club and is in the heart of the golfing southwest with a number of parkland and links courses within easy driving distance. While visiting Killarney reside in truly elegant style at the Killarney Royal Hotel. Owned and managed by the Scally Family for three generations gracious hospitality awaits you at this haven of tranquility in the heart of Killarney Town. This boutique 4 star hotel offers a cosy reprieve from the hustle and bustle of everyday life with the majestic beauty of Killarney at your doorstep. Luxurious accommodation is enhanced with antique furnishings with the option of feather duvets or cosy Irish blankets. Each room is en-suite and includes complimentary Wi-Fi access air-conditioning and plasma screen televisions. Large marble bathrooms include a selection of Irish Eco Friendly products for your convenience and we offer an in-house laundry and dry cleaning service which is available to all our guests. Guests at the Killarney Royal Hotel can also enjoy complimentary access to a nearby leisure and spa facility. Relax in a sumptuous and comfortable atmosphere where you can indulge in a wide range of treatments and therapies. With a number of dining alternatives this top Killarney hotel is the ideal dining choice whatever the occasion. Light bites throughout the day a quick or filling lunch renowned Afternoon Tea and sumptuous dinners Killarney Royal Bar and Bistro and The Royal Restaurant both offer exceptional quality and variety for the avid diner. With gorgeous views of the mountains, these self-catering apartments are situated in the heart of Killarney National Park, and have free parking on site. Muckross House and Gardens, Torc Waterfall and Ross Castle are just minutes away. Set in Killarney, this holiday home features a patio and a garden. 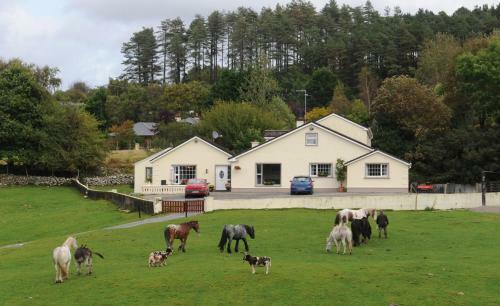 The property is 1.4 km from Muckross Abbey and boasts views of the mountain. Free private parking is available on site. Lake Shore, Muckross Road, Killarney, .